By Dan Ambrose: IBF/wBA/WBO heavyweight champion Wladimir Klitschko (56-3, 49 KO’s) is expected to make easy work of fringe contender Jean Marc Mormeck (36-4, 22 KO’s) next month on December 10th a the Esprit Arena, in Dusseldorf, Germany. This is supposed to be a mismatch, but we could see a very different outcome if Mormeck is able to get inside on Wladimir. This is the smallest opponent that Wladimir has faced in many, many years, and it’s doubtful that Wladimir is going to know how to deal with such a short target. 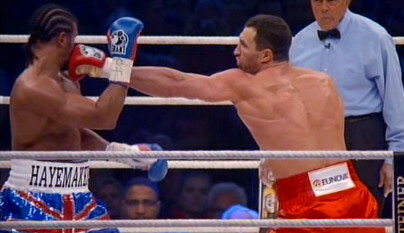 It’s not that Wladimir won’t do well with his jab while he’s on the outside. There’s no question that he’ll do well when he’s got Mormeck on the end of his jab. However, Wladimir’s problems will surface when he tries to land his right hands. He’s going to be forced to punch downward on Mormeck and this will take a lot of the power off of Wladimir’s shots. At the same time, Mormeck has a quick inside move that he likes to use to get close to his taller opponents. If Wladimir will have a chance to nail Mormeck while he’s coming in, but we’ve already seen that Wladimir’s accuracy is erratic to be sure. He misses a lot, and with a fighter as short as Mormeck, it could be a major problem for Wladimir if he misses and gets countered. Mormeck is a lot like Joe Frazier with his head movement and powerful left hook and right hand. Mormeck likes to come in low, make his opponents miss with his head movement and then nail them with big shots. Wladimir won’t be able to handle getting hit with Mormeck’s biggest shots on the inside, and we could see a major upset on December 10th when Wladirmir and Mormeck meet up. If Mormeck can keep getting inside on Wladimir, he’s going to have ample opportunities to end the fight with one of his big shots.